The setup was just about perfect, at least for a public-hunting spot. Days of pre-season scouting had yielded a pair of gobblers consistently roosting in a majestic white oak. We knew where the turkeys would fly down, where they would meet with hens and where they would strut when they were done with hens. The downside was that the spot was only 150 yards from the public access point. The parking was tight with only room for two cars, so my hunting buddy, Paul, met me at the access point well before dawn, hoping that our two cars would deter most of the slept-thru-their-alarm- clock turkey hunters who would drive in a panic back and forth between numerous spots at dawn. Most hunters would pull in, see our cars and back out to find a new spot. If we were patient and we let the early-morning traffic die down, we would have a good shot at a few gobblers. We managed to get a bird. But through the next few years things changed, as it seems that the patience, methods and ethics of turkey hunting has taken a weird, and in some ways less safe, turn. In the last five years, I’ve had guns aimed at me, had hunters rain shot over my decoy spread to scare off my gobbler, because they wanted the bird more than I did; and had hunters crawl into my decoy setup hiding behind turkey fans, calling like an gobbler. Nowadays, it seems like you have to go the extra mile to get away from the crowd. And there is research that backs this idea. Recently, the University of Georgia tracked wild turkey hunters in a 3,500-acre Louisiana WMA over two years to study their behavior and where they spent their time. They used GPS units and followed 151 hunter track logs, and the results were very interesting. On average, hunters hunted six hours each day, traveling on average 3.7 miles during a hunt. However, on average, hunters stayed within 327 yards of roads and access trails, and the mean daily maximum distance from a starting location (parking area) was 0.9 miles. They also found that 50 percent of hunter locations occurred within 59 feet of an access trail or road, with 2.9 percent of the WMA containing 50 percent of hunter locations. What it basically means is that most hunters don’t explore more than a mile from their vehicle. When they set up to hunt, they are generally within easy sight of an access trail or road. Most hunters tend to bunch up and hunt the same spots. One could argue that the hunters were concentrating on the best turkey spots or travel to other parts of the WMA was difficult, but if you like to hunt in a crowd, you won’t like the results from the follow-up research. A follow-up study by the same group of University of Georgia researchers looked at the effects of hunters on the movements of turkeys using GPS tagged turkeys, to see if high hunting pressure has an effect on their behavior. The researchers monitored 12 male turkeys and found that hunter presence overall had little effect on male movements; males increased distances moved by 6 percent on hunted days compared to non-hunted days. The distance between consecutive roost sites did not significantly differ on hunted versus non-hunted days. However, turkeys that survived the hunting season tended to more often encounter areas of great hunter presence, suggesting a learned anti-predator behavior. So turkeys that lived in high-pressure areas learned how to avoid getting killed by learning to recognize the calls, behaviors, decoys and movements of hunters. High-pressure birds are educated by hunters. What we are seeing in turkey hunting is very similar to what happened to goose hunting. For many years, a simple decoy spread, a call and a gun is all you needed to hunt geese. As goose hunting grew and hunting pressure increased, birds became more wary of decoys and tougher to hunt. Decoys became more realistic with flocked full-body decoys the standard, hunting tactics are more aggressive, and call sequences are more than a single honk to get the attention of the flock. Turkey hunting is seeing the same sort of arms race in a sense. Poor hatches and high hunting pressure have left a lot of older, smarter, wary birds in the field. In response, decoys are becoming ultra-realistic, and tactics such as fanning/reaping are very aggressive. 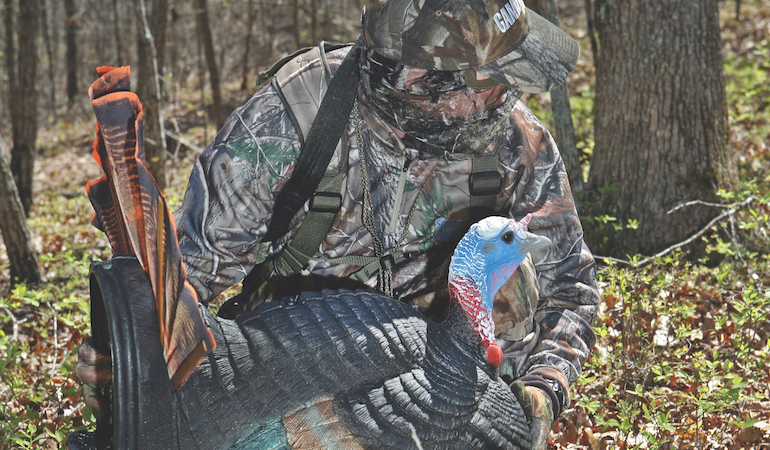 Hunters are challenging the gobbler, instead of subtly calling him to a spread of decoys. If you want to follow the crowd, you can learn how to fan, call aggressively and compete to get the attention of smart and wary birds, or you can try to find less wary birds that experience lower hunting pressure. Based on research, it may be as simple as literally going the extra mile. Finding a turkey more than a mile from an access point means that bird is less likely to interact with many hunters and may respond better to calls. It may not be practical on small or private property, but large public areas are ideal for these tactics. You also will be less likely to have to compete with the crowd if you move away from trails or access points as most hunters do not stray far from a trail or road. Try it this season, and you may be surprised by the positive results!